nc1700sJordans > SGT CORNELIUS JORDAN…related to WHOM? During the first few months of 2011 I was using classic genealogy tools/protocols. I could easily trace to our CORNELIUS JORDAN of WAKE who fought for the North Carolina 31st Infantry during the Civil War. He enlisted in Auburn, Wake county. Daniel Gould Fowle, a man who would become GOVERNOR in 1888 enlisted our ancestor. The 31st was being organized and under the command of a Colonel J.V. Jordan from Craven County. When our 25 year old Cornelius enlisted he was immediately given the rank of SGT. WHY? Initially I wondered, are we related to Colonel J.V. Jordan in some way? The questions didn’t stop there. There was another Wake county Jordan, Henry B. Jordan, son of Calvin C. and Rebecca Bagwell Jordan, also from the same region of Wake our Cornelius had called home as a boy. Henry B. was made Lieutenant! Our Cornelius and he served in the same regiment and company, D! Henry’s big brother James B. Jordan was in Tennessee at the time war broke out. 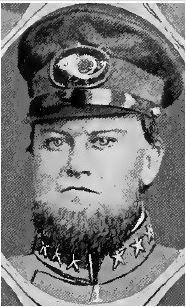 He came back to Raleigh enlisted and was elected as First Lieutenant for the Wake Guards, 26th Regiment Company D. He would quickly be appointed adjutant by Colonel Zeb Vance. His war experience would take him to Gettysburg where on the third day after being wounded in the hip, he was captured and sent to Johnson’s Island, Ohio where he spent the rest of the war as a POW. Was our Cornelius related to Calvin C. Jordan’s boys? James B. Jordan 26th Regiment Co. D.
Try as I might I couldn’t connect these Jordans using classic genealogy toolkit. We were/are stymied at Matthew M. Jordan, Cornelius’ grandpa. The man is largely an enigma. His last will and testament was the oddest one I have ever seen. It was mainly a means to put to paper instructions for trust funds for some grandchildren, all girls. His own sons were not made executors, though Joseph A (Cornelius’ father), a John, a James, and a Merit were all living at the time their dad died. There is no mention of land. Yet our Cornelius just before he wed owed over $700 to a William Poole. Why is unclear. Cornelius sold a parcel of land in Raleigh described as being next to the quarry to help him satisfy the debt. A Mr. Larkin Allen, agent for Mr. Poole, appeared in open court to acknowledge the debt had been satisfied. Where Cornelius got this land is unclear. So many records for the region are missing. Maybe if the Seven Springs Courthouse had not burned twice, the Pitt courthouse, the Johnston county records for a great deal of the 1700s, … maybe we could have a chance of piecing together relationships using classic genealogy techniques. Instead we have Matt’s odd will with son-in-law Young Allen Barber, husband of his eldest living daughter Rebecca, and with whom he resided at the time he died as the lone executor. The probate court record was the shortest I have ever seen. It was one sentence. “Y A Barber appeared and appointed executor for Matthew M Jordan’s estate”. Matthew appeared to live in the Elevation/Four Oaks region of Johnston County. This was Barber central! And so far no deed has surfaced for him. His will noted his actual eldest daughter Allana Jordan Gurley, wife of Daniel/David Gurley had died before her dad. Matthew was making provision for Allana’s daughter, Sarah Jane Gurley. The will also listed a Susan C Norris, wife of Needham B. Norris and another Jordan granddaughter Tabitha Winifred Jordan. It is an open question whether Susan C. was a daughter of Matthew and had Tabitha out of wedlock children or if Susan Catherine Norris had a prior marriage to a son of Matthew producing one or two little girls. Regardless she wed Needham Bryant Norris just before Matthew Jordan died. Matthew’s will didn’t name his wife. Matthew nor his son Joseph our direct ancestor, each wed but the surnames of their brides are not known. No marriage bonds have been found to help us. Matt’s will lists Joseph A, Merit, John, and James as living sons and there were no guardianship records so all were of legal age at the time their father passed on to glory. Why weren’t any of his sons executors? None were even witnesses to the will! His grandson, Cornelius, I reasoned should be easier to track. He was in the Confederate Army. He lived, enlisted, and initially trained in Wake county! He was at Roanoke Island, White Hall, Charleston, Ft. Darling, and finally Ft. Fisher. He had been a prisoner of war after the Roanoke Island battle for several weeks. His company won their freedom in a prisoner exchange. Surely by the time I was working on our family history some Confederate reseachers/historians, perhaps Wake County or regional historians, or North Carolina families who connected to our Cornelius in some way would have material to help me solve the mysteries. I read of the monument effort, the reunions, and the re-enactments after the war. The Confederate monuments effort was largely attributed to a group a WAKE Co.war widows and for some reason Col. J.V. Jordan’s widow was always included. He was from Craven Co. though? Her surname was Lane, a name synonymous with Raleigh and a name that laces through many Jordan pedigrees. Perhaps she had ties to Raleigh and our Jordans? So many questions. Calvin C. Jordan’s branch had intrigued me for some time. Did that C. in the middle name stand for Cornelius? Or perhaps Carroll/Carrell? When his first wife, Rebecca Bagwell passed on to glory, Calvin C. wed a Stephenson gal. He decided at some point to pull up stakes and move to Cottage Grove, Henry, TN. He had two families with two wives and LT. Henry B Jordan’s and James B’s mom was CC’s first wife, Rebecca Bagwell. There seems to be discord as to what the B represents. Some say it stands for BELL others say BERRY. I have wondered if it could stand for Bagwell, their mom’s maiden name? There were paper fragments which opened the door to speculation about multiple Jordan connections. The questions didn’t stop with Wake county where Cornelius and his military services went… while serving the 31st Infantry was called to protect Richmond and while making their way to Ft. Darling, they “camped at a Jordan farm” somewhere in Southeast Virginia. The account is vague. Perhaps someone from those VA Jordans knows which Jordan farm? Exactly where? And why the 31st stopped there? Were these VA Jordans related to COL. J.V. Jordan? Or perhaps there was a connection with the Wake Jordan boys of the 31st? I will revisit this question in a follow-up post as I delve into my NC 1700s JORDANS work. I knew DNA could quickly give me information to help me see the paper records with new eyes. I could learn quickly if families were related to our JORDANS. Interestingly, I found these very Jordans (part of what I like to call the WAKE cluster) I was curious were also stymied with their own pedigree work! No one seems to know who Calvin C. Jordan’s parents were. The biography for a Civil War Colonel remains conflicted about where he was born and who his parents were. The relationship between colonial Virginia JORDANS and colonial North Carolina JORDANS are confused by volume after volume of conflicting published genealogies. I found enough to almost wallpaper my whole house! In order to clear through the speculation and KNOW takes cooperation. The Jordan branches mentioned in this post and others in the vicinity would need to establish their branches in the familytreedna.com database. It is similar to a puzzle. missing pieces prevent success in completing it. Each branch represents a puzzle piece. Our puzzle piece is established in the familytreedna.com database. My NC 1700s JORDANS PROJECT is an active research project to help establish all of the colonial branches. Pedigree charts may give us the names of ancestors, DNA can help us KNOW our ancestor in a way no other technique can offer. Our ancestors can speak directly to us!